Setting up an internet radio station is a very EASY and CHEAP way of creating a live broadcast! We provide premium quality services to help you along the way. To learn more about our services – feel free to browse our site and If you have any questions please contact us. Many other providers will oversell their servers to offer you a cheaper price, we beleive this is unfair and simply wrong. We will NEVER engage in this practice and always aim to offer our customers the best possible service available! All users have access to an easy-to-use web-based control panel, allowing you to manage your own streaming server account. You can stop and start your server, manage your server configuration, view data transfer and listener reports, review logs, and obtain access to a variety of information and statistics about your streaming server. This is a great feature which allows you to upload a pre-recorded mp3 file to our server, this mp3 will played to EVERY listener that connects to the stream, BEFORE the live stream starts. What does this mean you for? Quite simply it’s a great way to raise some extra revenue for your station! You can on-sell this space to your advertisers; add it as an inclusion to your advertising pack or sell it as a standalone option, the choice is yours. If for some reason you cannot deliver your stream to our server, we offer you the option to have a fallback stream setup. So if your live stream drops out, the fallback stream will takeover. There is no need to disappoint your listeners with dead air, give them something to listen to until your live stream reconnects. In addition to providing total control over your streaming server, we also provide complete server-side source support (also known as “Auto DJ”). Never again will you need to rely on your own PC to broadcast your stream! When enabled, you may upload your media (MP3s, etc.) directly to the server via FTP, manage your media through our comprehensive AJAX Media Library system, and schedule your media using our advanced playlist scheduling system. Our AJAX-driven media library system brings the convenience and usability of a desktop media player’s song management interface to the web. 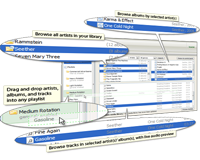 The layout of the interface is reminiscent of the media library functionality provided by today’s most popular desktop media players. Media can be searched or browsed by artist, album, title, or genre. A track preview feature is also available, which plays a 10-second clip of the selected song(s) to assist in identification. Once located, tracks can be added to a playlist simply by dragging and dropping them on the desired playlist. 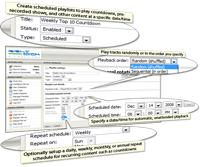 Through the use of our advanced playlist scheduling system (described below), this drag-and-drop functionality can be used to instantly schedule the selected tracks to play at a given time, or on a repeating schedule. We support multiple playlists for each stream. Each playlist can be configured individually to control precisely how and when it will be played — at a specific time, on a repeating schedule, or on a rotation schedule with support for ranking by popularity (known as “weighting”). We’re excited to announce the release of our new Radio Player. Its cross-browser, multi platform, mobile device ready! Regardless of the device the listener is using, iPhone, Android tablet or PC, IT JUST WORKS! Includes social network integration for maximum listener impact. More details about the player can be found here. – Plan prices are based on a 40Kb/sec stream for the ‘Basic’, and 128Kb/sec for ‘Premium’. – Per day price for the Premium plan already includes the community broadcaster discount.